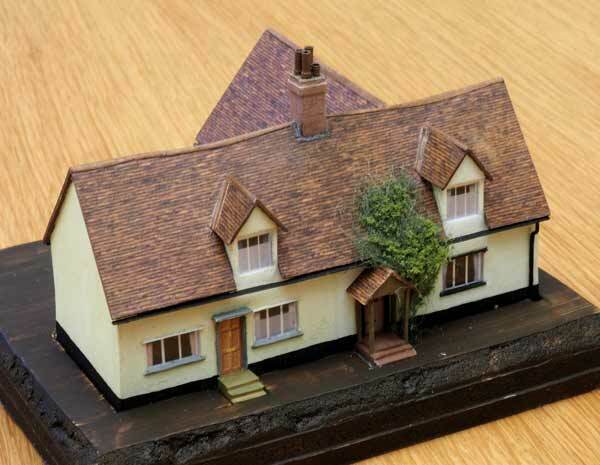 I want some more buildings to go on the central section of the layout which need to look good next to some cottages built in the spring of 2014 and shown on page 2 of this site. I'm basing the model on a particular building, but intend to introduce some changes. I gauge the size of the building from Google Maps satellite view and get an idea of how the front looks from Street View. I start by drawing the walls using Photoshop. I create a new document setting the resolution to 100 pixels per cm. 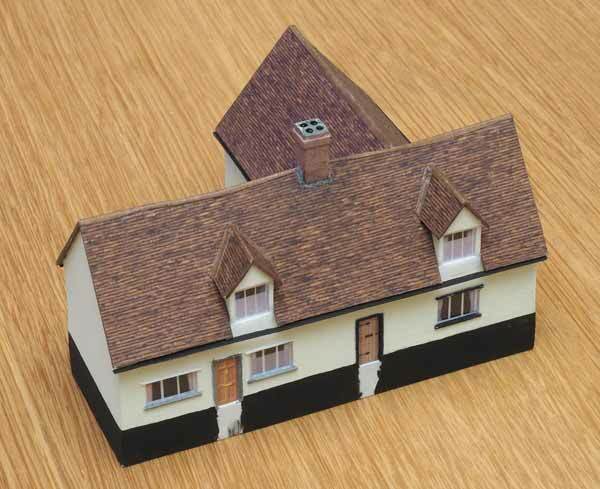 This gives 10 pixels per mm, so 20 pixels represent 1 foot of the original building in 2mm scale. I draw the outlines of the walls on one Photoshop layer. 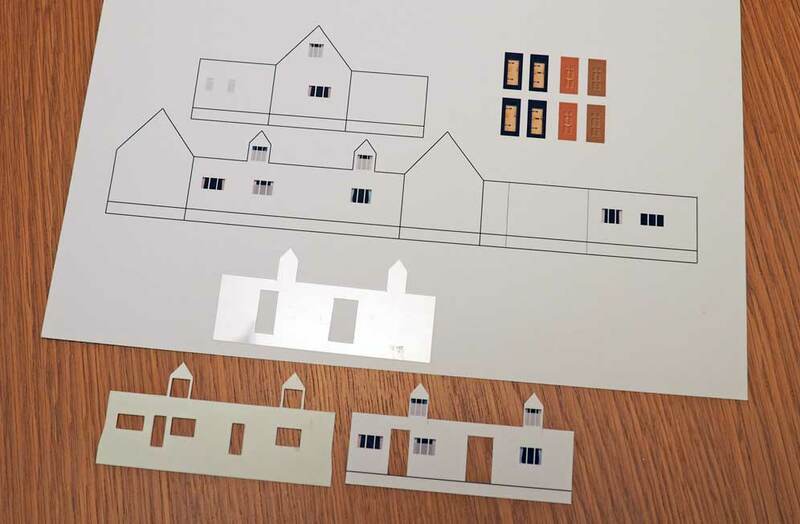 Cut-outs for windows and doors are indicated by grey rectangles drawn on a second layer. I mark an approximate ground level, leaving extra below it. I like to have some foundations for my buildings which will be buried into the scenery, eliminating the risk of a gap under the building. This particular building will have steps leading up to the doors. 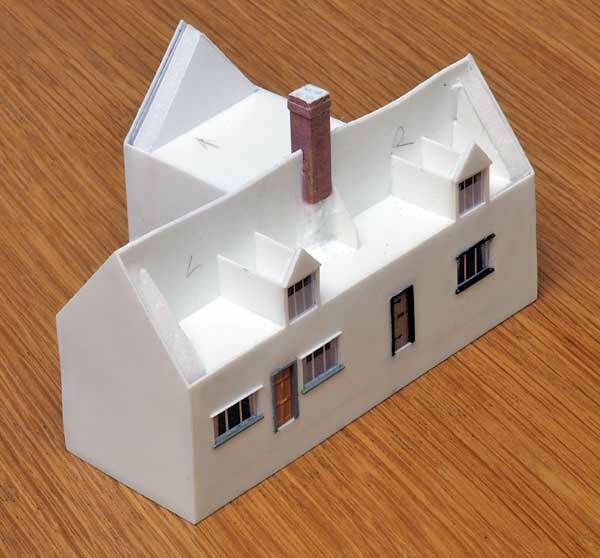 I print the drawing onto 160gsm paper and fold it to give an impression of how the model will look. If all looks ok the next job is to cut out the walls from 20 thou plasticard. My early models were cut by hand. I printed the drawing onto label paper which I then stuck to the plasticard. I cut out the window and door openings first. I don't try to cut right through the plastic, instead merely scoring it. Then I cut diagonals into the corners, going right through. The resulting triangular pieces can then be 'snapped' out. Next I cut out the walls and then remove the label paper. My present method for cutting out the walls is to use a Silhouette Portrait machine. I import the Photoshop drawing (saved as a jpeg) into the software that comes with the machine and mark all the lines that need to be cut using the drawing as a guide. I re-arrange the walls to fit them onto the plasticard with as little waste as possible. The next diagram shows the result, a screen grab from the Silhouette software. 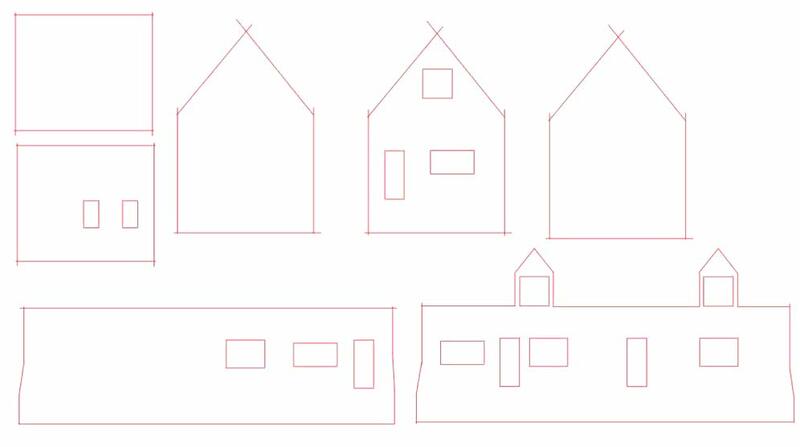 I want the end walls of the building to bulge slightly so I've made the necessary changes to the drawing. I don't use separate window frames in most of my models, instead I employ a little trick that seems to work well in N gauge, but almost certainly wouldn't in the larger scales. I print the frames (and other window details) and glue the result behind the glazing. This little trompe l'il isn't normally noticeable - only when light catches the window at a certain angle does it become apparent. And it's certainly a lot cheaper than buying etched frames, especially when they are non-standard sizes and would have to be specially made. So, returning to Photoshop I draw in the window panes on a new layer, leaving space between and around them to represent the frames. The window cutout rectangles drawn earlier allow me to place the windows correctly. I add curtains on another layer and the nets on yet another. I increase the transparency of this last layer to show the long curtains through the nets. I often add possible doors to the drawing before making two or three copies of the result (with the window cutouts layer switched off). From one of the prints I cut out the wall shapes, cutting a bit inside the outlines. Then, using another print as a cutting guide, I cut the same shapes from glazing material, also cutting out oversized areas where the doors will go. In the next photo there is a copy of the print with the parts for the front wall. The glazing is the part sitting on the print and the plasticard wall is on the left below it. I add some surface detail to the plastic walls - sills, door frames, etc. These can then be painted as required. Window reveals are painted the intended wall colour. 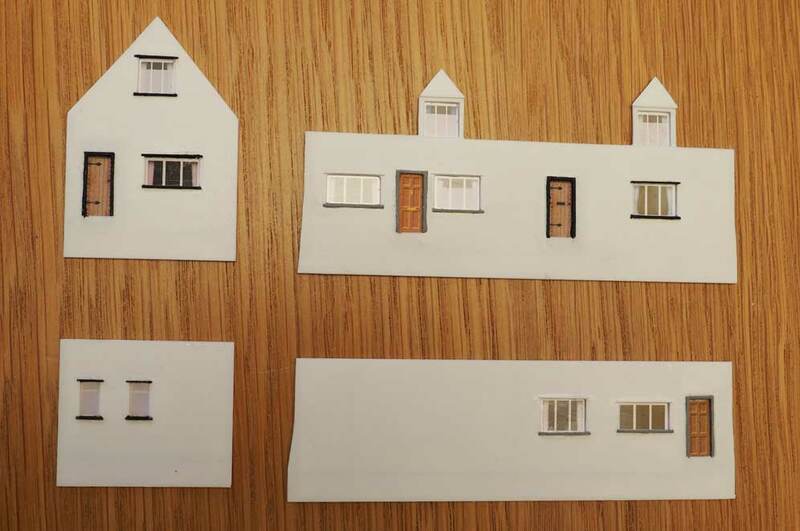 Then the layers of the walls can be assembled, plastic, glazing and printed windows. I use Deluxe Materials Glue 'n' Glaze for this job. The doors are also fitted at this stage. I put the walls under a heavy book to keep them flat while the glue dries. Before assembling the walls I strengthen the end walls with 5mm foam board and prepare some more pieces of foam board to be used as I assemble the model. As soon as the walls are cemented together I glue these pieces into place and add some cross pieces to further strengthen the model. Once the main part of the building is complete I add the rear extension, again reinforcing it with 5mm foam board. When the glue has dried I use a small file to tidy up the corners. The next job is to make the chimney stack. I like this to pass through the roof, not sit on it with the risk of an unsightly gap. This one is made from four lengths of Plastruct. I drill a small hole in one end of each piece ready for the pots to be inserted later. Then I glue the four pieces together (making sure that the holes are all at the same end!). I wrap a piece of printed brick paper around the stack fixing it with Mek-Pak. The decorative trim around the top is a very thin strip of brick paper wrapped around the stack several times. Before cutting this strip from the paper I run a reddish brown coloured pencil along the edge of the sheet and then make sure that that edge is uppermost as I glue the strip in place. I find a Pritt stick is a good adhesive for this job. The roof sub-structure can now be added, incorporating the completed stack. A flat 'roof' is fitted into the walls and a central ridge piece is cemented to it, with some small triangular pieces to keep it vertical (they're at the back). The side walls of the dormers are added, performing the same job at the front. I cut into the ridge a bit so that the roof will look as though it's sagging slightly. I make the roof from 20 thou black plasticard. 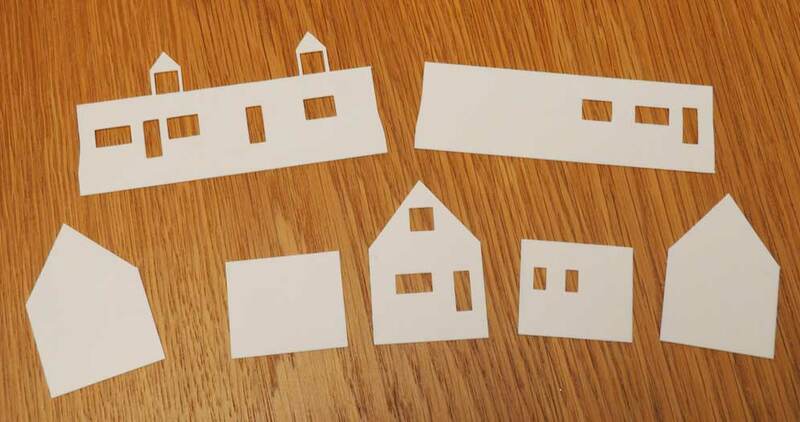 To get an accurate fit around the chimney and the dormers I start by cutting a template from paper or thin card. It sometimes takes a few tries before I get it right. I mark the template with small arrows if I need to make slight adjustments - they're visible in the photo. I use masking tape to attach the template to the plasticard and carefully cut round the shape. I keep the template as it will be needed again later. I fix the pieces of roof onto the model using Mek-Pak, starting with the front face. I trim along the ridge line with a sharp scalpel to preserve the curved shapes that were cut into the ridge earlier. Then the back face is added and again trimmed along the ridge line, finishing off the joint with a file. The process is repeated for the roof of the rear extension. The roofs of the dormers are added - a fiddly job requiring some trial and error to get the correct shapes. I've made the roof overhang the front wall rather more on the right hand side hoping that this will suggest some subsidence of the building. 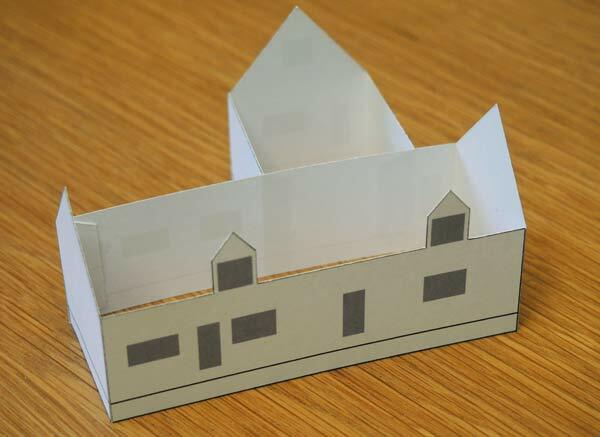 I cover the roofs with a printed tile paper. 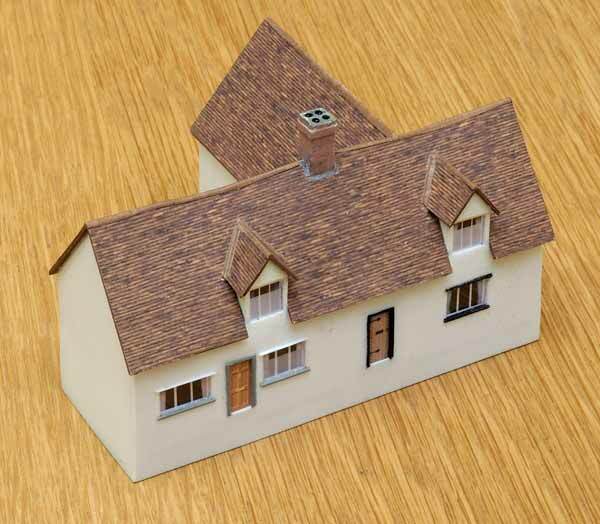 This was produced from a photo of a roof typical of the buildings in the area being modelled. Some cloning in Photoshop and a vertical stretching of the photo produced a large enough area for the model. It was printed onto a buff coloured paper. I prefer printed textures to embossed ones. 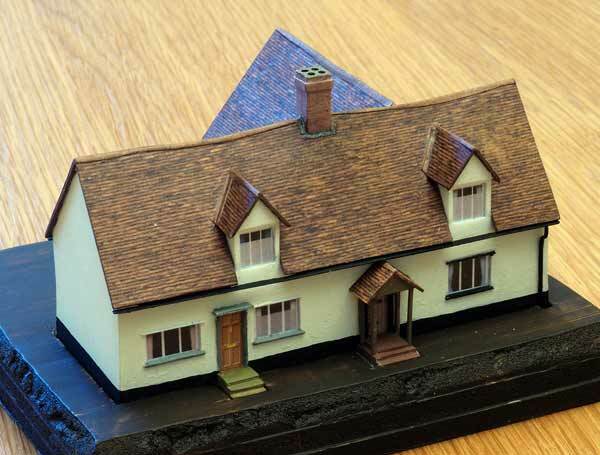 The latter seem to me to be too coarse in N gauge, and I don't think there's anything available that would be suitable for this type of roof anyway. 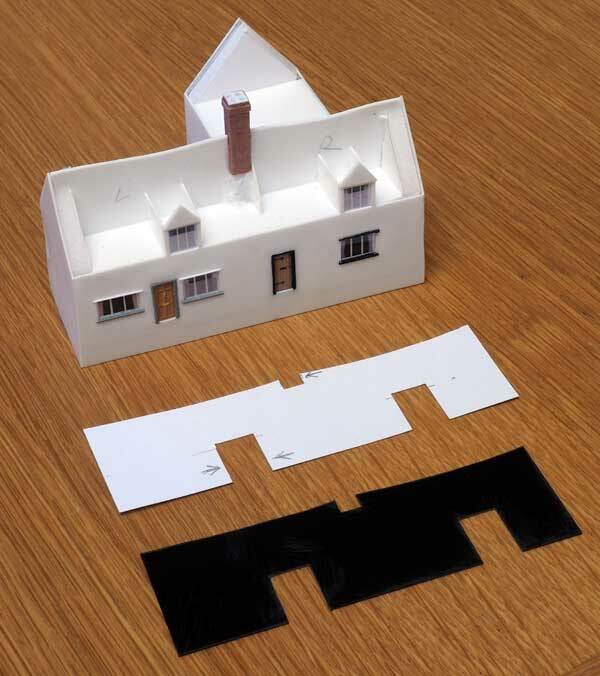 The tile paper is cut using as guides the same paper templates that I used when cutting the plastic for the roofs and is stuck down by washing it on with Mek-Pak. Printed ridge tiles, etc, are added. I use Pritt Stick again, moulding the paper into shape. I paint round the edges with Humbrol Brick Red (No.70) and later give the whole roof a coat of Humbrol matt varnish. I've tried several ways of suggesting the gutters, and this method seems to be the most robust. Like the windows I think this will only work in N gauge. I cut the plastic so that it can be cemented to the wall, but I narrow it at the ends so that it looks like a gutter where the width can be seen. I also file the underside of the front edge to suggest the shape of a gutter. 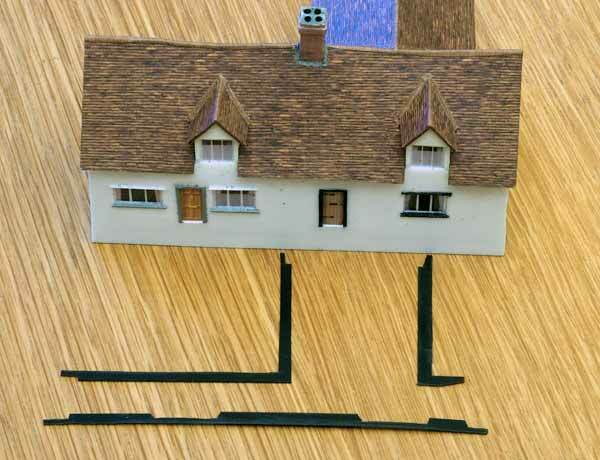 The gutter is going to pass the dormers where it also has to be narrowed. Leaving it a bit over scale reduces the risk of damage when handling the model. I've fitted the gutters and given the walls a coat of paint. For some of my first buildings I mixed up a colour using artists' acrylics. The snag with this is that it's very difficult to mix up matching paint if any retouching is required later. So this model is painted with a pale cream from a sample pot from the DIY store. I leave the areas under the doors unpainted ready for the steps to be added. Next I make the downpipes. Using wire I bend the curves at the top using round nose pliers (as used by jewellery makers). I leave the wires over-long and bend the lower end at roughly a right angle - I find this makes handling easier. 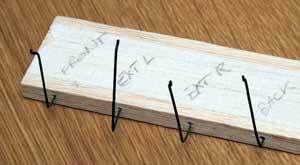 I spike them into a piece of balsa for painting. I make no attempt to represent the fixing brackets. 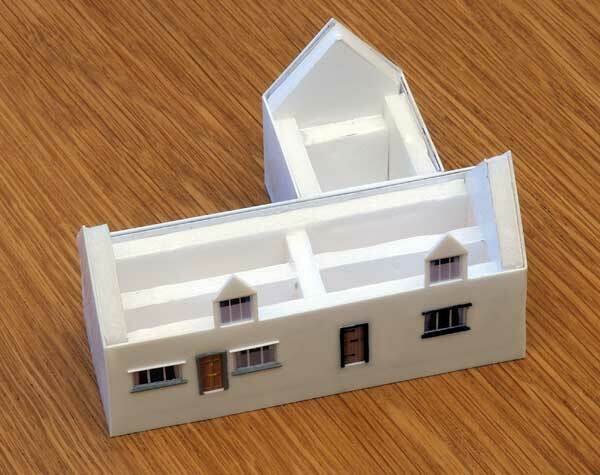 A crude base made from foamboard gives a better idea of how the building will look when installed on the layout. The downpipes are fixed on with super glue. I put a small dab of glue on a piece of paper and run the downpipe through it - this avoids getting too much glue on. The wire is trimmed to length using Xuron track cutters. The doorsteps have been added, made from layers of 30 thou plasticard. Rather than make each set of steps separately I made up a length and cut suitable sized pieces from it using a razor saw. 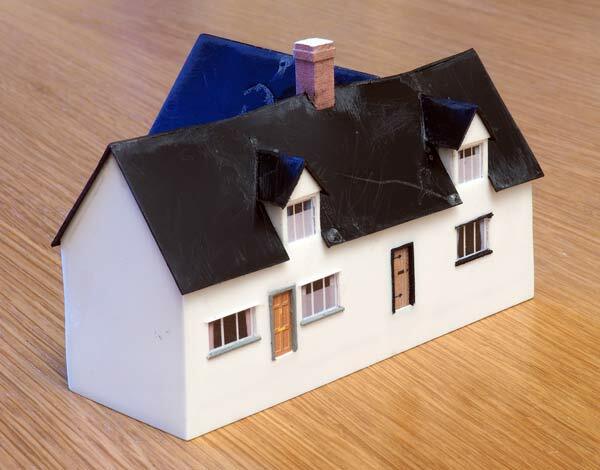 The porch is made from 20 thou for the roof, 'supported' by 30 thou square plastic strip. Some final touches are added. The walls of the left hand cottage have been given a wash of very diluted artists' acrylic raw umber. Chimney pots have been added - they're from Peedie Models. And a plant now grows over the porch and up onto the roof. This was made from a small piece of the material used for stuffing soft toys, sprayed green and with some fine Woodland Scenics turf sprinkled on. I fixed the stuffing material with WS Scenic Glue and later applied some drops of WS Scenic Cement to fix the turf.